Many mind sets believe life comes marching at them in a neat, linear manner. One at a time. Like the old card game War. Like one thing after another. Linear as opposed to non-linear. But how does one classify the projects one has started, but not finished, in one’s past? They seem somewhat similar to ghosts of the past who decide to haunt at particular times. These ghosts have been known as creative muses. One of the things I’ve always tried to understand and see is who is on “center stage” of my creativity. What particular muse to follow at this particular time. A number of them beckoned so a form of selection was involved. But what should inform this selection? If anything. Times like this one needs to simply acknowledge life rather than attempt to change it. And if one acknowledges life, then the best muse for the moment might present itself. 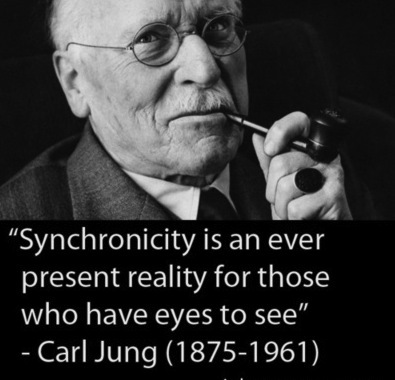 Synchronicity is a strange concept first identified by Carl Jung as a type of acausal connecting principle. Based much on the ancient philosophy of Tai Ching. Our age is one of division, exploding outward. The theories of the creation of the universe continue the exploding outward motif. But what of that power called magnetism or gravity that pulls together rather than divided or explodes apart. Synchronicity is this power. It is a power that projects inward rather than outward.